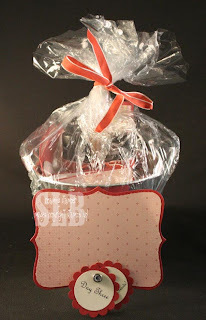 Yesteday and today, I opened my last two days of Cupid gifts. I have to say that I was blown away by what my Secret Cupid did for me. Her gifts were beautiful and honestly, I'm quite speechless. She wrote in her note that she was intimidated when she learned she was going to be my cupid. While I appreciate the fact that she holds me in "high esteem" (her words), I can't imagine why she would be worried because her gifts are amazing and she is truly a wonderful stamper and a great friend. Pam, you rock and I can't thank you enough for the wonderful gifts you gave me. They truly made my week (and made my DH a little jealous too..LOL)! Here's my day two gifts. I would have posted last night but was feeling a little under the weather. The best thing is I have a spot in my stamp room for this framed art! I had a strip of wall just begging for something to be put up there and now I have it! Pamela, took three square frames and using the Bella Birds paper made a nice background for her art. 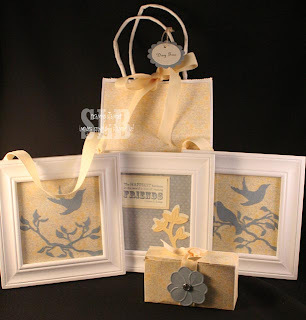 She then used the new Birds & Branches die and the Sweetest Stem embosslet to create the art. She added in a great quote from the Friends 24/7 stamp set as well. So, now I have great one of a kind artwork for my Stamping room walls made by the one and only Pamela! Oh, and to top if off she sent me a little box of chocolates too....who wouldn't love a gift like this?? Below is today's gift. There are two sho ts, one is the packaged tin and one is after I opened it up. Inside the tin is what I like to call a day at the spa...there are some great Cherry Blossom products from Bath and Body works, a nail file, some clear nail polish, and a lip balm. 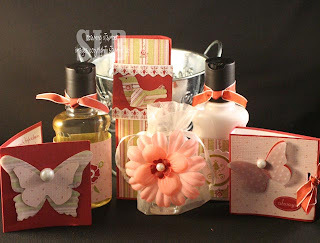 These were all painstakingly covered using the paper from the Sweet Nothings Simply Scrappin' Kit which happens to be a favorite of mine (I wonder how she knew that)! Anyway, all I can say I WOW and I can't thank Pamela enough for being my Secret Cupid! From reading the posts, my cupid has been enjoying her gifts as well. I'll be sharing those projects tomorrow. wow! Another gorgeous gift set - Pam did a great job! YES she did! I have no idea why she was concerned. I'm over the moor about my gifts!